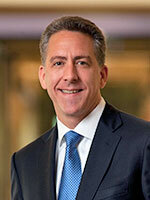 Ian A. Waitz is the Vice Chancellor and Jerome C. Hunsaker Professor of Aeronautics and Astronautics at the Massachusetts Institute of Technology. As Vice Chancellor, he leads the offices of undergraduate and graduate education and is responsible for overseeing the first year undergraduate educational experience, as well as catalyzing and leading broader institutional efforts to improve residential education. Reporting to the Chancellor, Waitz also works closely with the Vice President and Dean for Student Life, the Dean for Digital Learning, and School and Department leadership. He has been on the faculty at MIT since 1991, serving as the department head of Aeronautics and Astronautics from 2008 to early 2011, and as dean of the School of Engineering from 2011 until June 2017. While dean of engineering, he introduced policy changes to increase effectiveness, transparency, and collaboration in the hiring and promotion of faculty, the management of finances and resources, and the efficacy of teaching and research. He also promoted novel models and opportunities in residential education, such as co-launching the MIT Beaver Works Center. The center supports collaborative efforts between Lincoln Laboratory and MIT’s Cambridge campus, enabling both institutions to make a greater impact on pressing global problems through research and education. Waitz was a supporter and early participant in MITx and edX, which offer free online courses, available worldwide, that harness the power of technology to improve education and drive systemic change. He strengthened several key MIT-wide co-curricular programs, including the Bernard M. Gordon-MIT Engineering Leadership Program, the Undergraduate Practice Opportunities Program, and the programs of the Office of Engineering Outreach. In addition, he championed flexible engineering degree programs and increased support for teaching in the School of Engineering as a whole by more than 30 percent. Waitz helped spark new programs and spaces for innovation and entrepreneurship, including the creation of the MIT Sandbox Innovation Fund, which provides all MIT students with an opportunity to move innovative ideas forward. Under his leadership, the School of Engineering advanced a proposal that helped catalyze the MIT Innovation Initiative. He also successfully articulated the need for expanded maker spaces on campus and lobbied on behalf of the School of Engineering for the creation of MIT.nano, which will be a hub for accelerating nanoscale research when it opens in 2018. Waitz is, at heart, a problem-solver, and that trait defines his leadership, motivates his research, and inspires his actions. To help power the people, education, and innovation he values, he has established resource development personnel in all departments, which led to a nearly threefold increase in yearly giving to the School during his tenure. He has also strengthened partnerships with alumni, industry, and donors by highlighting the benefits of engaging with MIT broadly. In his own research, his desire for answers has led to advances in gas turbine engines, fluid mechanics, combustion, and acoustics. His most recent focus has been the modeling and evaluation of climate, air quality, and noise impacts of aviation, and the assessment of technological, operational, and policy options for mitigating these impacts. These efforts have led to more rigorous and rational evaluations of environmental policy and technology. He is a member of the National Academy of Engineering, a Fellow of the American Institute of Aeronautics and Astronautics, and has been recognized by multiple awards for teaching and research, including a MacVicar Fellowship from MIT. Waitz recognizes that attracting and retaining the most talented people in the world is crucial to continued success at MIT. He is committed to expanding pathways for engagement; opening more opportunities within MIT and beyond; and providing an exceptional, inclusive, and fun learning and research environment for all students, faculty, and staff. You can also learn about his research by watching Professor Waitz's lecture on the environmental impacts of aviation.